and chapels, restored monasteries and convents, old parsonages and vicarages, and any former ecclesiastical or religious building where the original character of the building still shines through –Â including hotels, B&Bs and self-catering in the UK, abroad in Europe and Worldwide. Cairns House is a five bedroom church conversion with a stunning contemporary interior that manages to maintain the "wow" factor while still creating a functional and cosy living space. A stylish coastal holiday home, Christ Church is a restored former chapel. Created from the rear part of the original chapel, it retains many original features – including a working pipe organ! This self-catering holiday home is in the heart of the village and is within an easy walk of the beach. Peak District self-catering in a wonderfully converted church, set in the heart of the picturesque village of Tideswell. The property is beautifully decorated in contemporary style and offers spacious, quality accommodation with many original features such as tall ceilings and arched windows. This unique holiday gite in the Dordogne is a renovated medieval chapel dating from 800 AD. It's equipped with every modern convenience and very comfortably furnished but still full of atmosphere. It has one bedroom and can sleep up to three people; also a bathroom, living/bedroom and open-plan kitchen. Outside is a BBQ, shared garden with furniture, patio and shared swimming pool. A former chapel and school house converted to three separate self-catering holiday properties, which can be interconnected, if required, to sleep up to 10 guests. In a great location with access to the cities of both Bath and Bristol. Stunning church conversion situated yards from the North Tyne near Kielder Water. The property features original features such as stained glass windows and intricate stonework. The upside-down accommodation has 4 bedrooms plus bathroom and shower room on the ground floor; and an open-plan living room with kitchen, dining and sitting areas on the first floor. A choice of luxury holiday apartments at The Highland Club in the converted St Benedict's Abbey at Fort Augustus. Highland Club facilities include swimming pool, gym, Club lounge, tennis and badminton courts, croquet lawn, table tennis, barbecues, loch fishing rights and an on-site restaurant. A one-bedroom luxury split-level apartment at The Highland Club in the former St Benedict's Abbey in Fort Augustus. Monastery Tower has access to all the Abbey's facilities which include: swimming pool, gym, full-size snooker table, library, Highland Club lounge, and restaurant. Converted chapel in a peaceful location in the well known National Trust village of Lacock, close to Corsham and Bath. The property has large arched windows with stunning views and underfloor heating throughout. Each bedroom has a 22" TV/DVD, two have large double beds, a 3rd ground floor bedroom offers flexible sleeping (bunk bed and double sofa bed). There's also a loft apartment, with private reading gallery and 4th bedroom. Converted chapel 10 min drive from beaches in Carmarthenshire. The Old Chapel offers an open-plan kitchen/dining/sitting area. Perfect for all times of the year, the property has underfloor heating plus a gas, wood-effect fire for winter, while the stone property keeps naturally cool in summer. A converted church tower with stunning views, located on the edge of the highland town of Crieff. This luxury, boutique, self-catering property has been rated 5-star by VisitScotland and has been beautifully fitted out to sleep up to eight guests in three bedrooms. A stunning contemporary holiday home created within the historic ecclesiastical annex to St Marys Church in Windermere, dating back to the C16th. This unique two bedroom property has a gothic arched window and vaulted ceilings. Comprising entrance hall, king size bedroom with en suite, twin room, bathroom, spacious sitting room, designer kitchen, dining room and secluded garden with furniture. A single bedroom apartment retaining many period features such as exposed beams, stonewalls and an arched church window which floods light onto the spiral staircase. Two bedroom accommodation, originally the Victorian School House and Vestry. It retains its original wall panelling, fireplaces and wood planked floors. A large two bedroom holiday home within the original main chapel and lit by four stunning tall arched windows. It has oak flooring through out and a mezzanine level living area. Ideal for larger groups this stunning contemporary church conversion sleeps up to ten people in five light-filled bedrooms. There's a bespoke kitchen, five bathrooms, a traditional dining area for up to fourteen people, a games area (with pool table) and a comfortable sitting area with flat screen TV, DVD, and state of the art sound system. The property has many interesting architectural features and has been featured in a number of interiors and architecture magazines including: Grand Designs, Homes & Interiors and has been featured on TV. The Scotsman described the house as 'one of the most arresting homes in Scotland'. A rather different sort of ecclesiastical building conversion, St Benedict's Abbey in Fort Augustus (Scottish Highlands) is a Victorian monastery that's been converted into luxury apartments, now known as The Highland Club – the holiday property on offer is in the Monastery Tower. It's a one bedroom luxury apartment with amazing views of Loch Ness from nearly every window. The apartment has access to all the Abbey's facilities which include the Highland Club lounge, swimming pool, gym, full-size snooker table, library and restaurant. This exceptional split-level apartment is packed with original features like the arched stone windows and stone staircase, but has been stylishly decorated in a modern style throughout. The property makes a wonderful romantic getaway for two or can be used by a party of four by utilising the large sofa bed in the main living area. 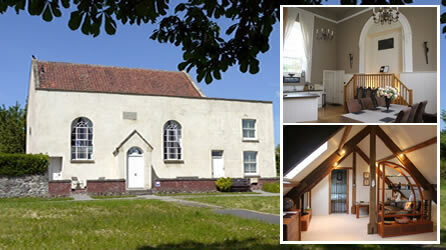 Renting holiday accommodation in a converted church or chapel will suit people seeking something a little different. It will usually be a historical property with architectural merit and original features which add character and interest. This is not restricted to churches either, in this section we list holiday homes in any former ecclesiastical or religious buildings where the character of the building has been maintained and original features retained â€“Â this includes churches, chapels, monasteries, convents, priories, abbeys, presbyteries, parsonages and vicarages which may have been converted to hostels, hotels, B&Bs and self-catering accommodation in the UK, abroad in Europe and Worldwide. Properties range from group and family accommodations in large renovated churches, to compact apartments in centuries old chapels. Features might include tall arched stone windows, stained-glass, high vaulted ceilings, wood panneling and beams, re-purposed pulpits and pews, renovated cloisters, even a working pipe organ! The travel-quest church and chapel accommodation section is for listing former religious buildings converted to holiday homes or used as bed and breakfast accommodation or within hotels and guest houses. See the definition at further up the page for more details.